Join the discussion on our forums! Come discuss Twilight Darkmender over in our dedicated Twilight Darkmender discussion topic. Battlecry: If your C'Thun has at least 10 Attack, restore 10 Health to your hero. First she separates them from the lights, washes them in cold water, and hang-dries. This destroys aggro and places a vanilla-stated minion on the board at the cost of 5 mana with the only requirement of buffing your C'thun, which you would do anyway. Awesome, just awesome. Also, you can use this with Auchenai Soulpriest or Embrace the Shadow to bm your opponent. I believe he obviously meant it, hence the *BM* your opponent.. I can see a shadow priest c'thun with this. Bye bye aggro, you won't be missed. Good stats, effect and art. Wonderful! can priest build otk cthun deck with cthun and alexstrza just in case your cthun isnt over 30/30?? 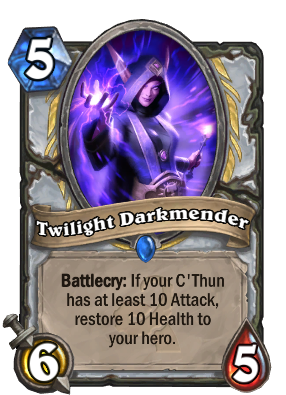 I would have loved to see this as a neutral to help out control C'Thun decks (I'm looking at you rogue). But I guess having 400 heal cards as priest is useful. I am really disappointed. It has no immediate board affect, making it slow. This is healbot on crack 10 health and good stats at 6/5. Combined with 2 hooded acolytes in your deck and this card is pretty insane. Also any two buffs from other cthun cards triggers this.